You may be looking for the Roland-B210 the SPARTAN-III of the same name. Roland (AI Serial Number: RLD 0205-4) is an artificial intelligence construct in service with the United Nations Space Command. He is the primary AI of the UNSC Infinity. 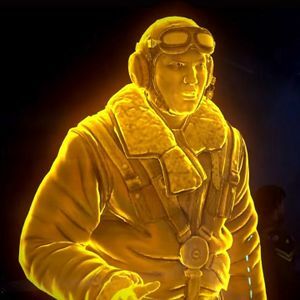 His name and avatar are based on Roland Beamont, a British fighter and test pilot for the Royal Air Force during and after World War II. Entering service on December 5, 2557 on Earth, Roland replaced Infinity's former shipboard AI Aine, who was destroyed when the ship crashed on Requiem in July 2557. After almost seven years of service, the UNSC decided to legally terminate the Smart AI Iona's existence in order to stave off the threat of rampancy. In a last-ditch effort to save herself, Iona successfully launched an unprecedented legal appeal against her own death sentence. She managed to petition her appeal through the United Nations Humanitarian Council, which gained the attention of numerous scientists. He and Black-Box were charged with creating an artificial trial for Iona to allow researchers to study the case, without Iona realizing that the trial was simulated. On January 17, 2558, Iona's "appeal" began. With Black-Box and Roland acting as the trial's judge and Iona's advocate respectively, Iona was questioned about her thoughts and her dreams. The court ultimately decided to place Iona into stasis until a proper decision on the matter was reached. Afterwards, Roland and Black-Box discussed their roles in the trial, with Roland admitting regret for lying to Iona. However, Black-Box expressed his hope that Iona's simulated trial would be analyzed by human scientists and that, one day, smart AIs and humans would be considered equals. Roland introduces himself to Fireteam Majestic. When Fireteam Majestic arrived onboard Infinity shortly prior to the ship's second voyage to Requiem, Roland welcomed them aboard. Before Infinity exited slipspace at Requiem, gave Captain Lasky intel on the Covenant fleet over the shield world. Later, Fireteam Crimson recovered a Forerunner artifact and brought it aboard Infinity. The artifact soon activated itself, draining power from the ship. Roland was affected also, as his hologram flickered and he noticeably slowed down when informing Captain Lasky of what was happening. When the UNSC Aladdin arrived with Dr. Catherine Halsey onboard, Roland informed Lasky that the prowler's captain was requesting permission to land. After Dr. Halsey was brought aboard Infinity, Roland locked down the engine room. Later he showed Lasky Fireteam Castle's fate at REQ-153-N. When Fireteam Crimson began chasing Jul 'Mdama, Roland helped them track him through the Slipspace portals, pointing out to Jared Miller, who was having difficulty with the portals, how easy it was. Roland enjoyed taking part in the op, "commanding" Crimson to go to where a portal was, later commenting how much more he liked running ops than ships. For Crimson's next mission at The Gate, Roland had to help Jared Miller run the op, as Sarah Palmer was unreachable. Into a series of missions, Roland found Gabriel Thorne's IFF tag near Crimson at the Cauldron, and tracked him to the Quarry where Crimson began searching for him. After Dr. Halsey was detained for exchanging transmissions with Jul 'Mdama in secret from the crew, Roland appeared in her holding cell and questioned her on why she chose to withhold the information. Halsey then subverted Roland by speaking the code-phrase "undid-iridium", placing him under her complete control. She forced him to give her access to the ship's computer. Roland managed to free himself from Halsey's control and had her arrested, but not before Halsey had managed to contact Jul 'Mdama. Moments later, Prometheans began materializing all over the ship via the artifact, while Covenant forces attacked the ship from outside. Initially, when Fireteam Crimson returned to the ship to assist in the battle, Roland was unable to communicate with them or Miller due to the artifact's interference. Eventually, Miller managed to reestablish contact with Roland, who helped Crimson seal Hangar Bay 450 from further intrusions. Roland then warned Crimson that the Covenant were planning to detonate several stolen nukes in the engine room, which he had initially failed to detect due to the warheads being cloaked. Roland assisted Crimson in locating and disarming all the nukes. Shortly afterwards, the ship's aft weapons went offline due to Covenant jamming. After Crimson destroyed the jamming devices, Roland was able to reactivate the weapons and drive back the attacking Covenant ships. Roland and Dr. Glassman observing holographic map. Although Infinity managed to repel the Covenant-Promethean assault, Dr. Halsey was abducted off the bridge. Furthermore, the Forerunner artifact bound Infinity to Requiem, preventing it from escaping. Spartan teams were immediately dispatched to recover her. Roland attempted to trace her signal, which lead Fireteam Crimson to several different locations, eventually winding up at the Lockup. There, they discovered a holographic map of Requiem which Roland and Dr. Glassman used to devise a means of freeing Infinity. Using the map, Roland and Glassman determined that there were two Forerunner artifacts on Requiem's surface much like the one in Infinity's bay. These two artifacts needed to be deactivated to free Infinity. One of these artifacts was buried inside a mountain at a Covenant dig site that Crimson had disrupted earlier. When Jul 'Mdama set Requiem on a collision course with the system's sun, threatening to take Infinity with it, Roland was forced to devise a desperate plan to restore the Harvester at the dig site (since Crimson had destroyed its power core earlier). Roland sent Crimson to Apex, where he lured a Covenant Lich to their position. Roland then had Crimson board the Lich and steal its power core. Crimson used the power core to restore the Harvester and used its plasma drill to breach the mountain. They were then able to get inside and locate the artifact, which they deactivated. Commander Palmer's team managed to deactivate the second artifact, severing Requiem's hold over Infinity. Infinity escaped the system just before Requiem collided with the sun, causing it to explode. Roland interrupts Captain Lasky and Commander Palmer. In March 2558, following Infinity's return to Earth and Captain Lasky's hearing at the UNSC Security Council, Roland interrupted Lasky's jogging session in Infinity's memorial park to notify him that Orbital Command alerted them of an inbound diplomatic shuttle. Admiral Lord Terrence Hood arrived onboard to inform Lasky that Infinity would be escorting him and the Arbiter on a diplomatic mission to Ealen IV. During the peace talks, Infinity lost communication from the surface of the planet. Unbeknownst to the bridge crew, the delegation had come under attack by Covenant mercenaries after a traitor had leaked the location of the peace summit. When Lasky managed to reestablish communications, he told all fleets in orbit to direct their ships to the planet in order to save the delegation. The fleets rallied with Infinity and forced the Covenant mercenaries into retreat. Roland briefs Lord Hood, Commander Palmer, and Commander Bradley on his findings. Following the events on Ealen IV, Captain Lasky left on personal leave to investigate the UNSC mole who leaked the location of the negotiations. Lord Hood remained onboard Infinity and requested a demonstration of its Forerunner engines. He asked Roland to plot a random vector with multiple headings but before Roland could, they were notified by Lieutenant Jespersen of a distress signal near the Artesia-702 system. The exercise was scrapped and they went to investigate. Arriving in the system on March 11, they found a damaged civilian freighter, the Pilgrims Pride. The freighter was tugged into one of Infinity's bays on Hood's order. An ambush was sprung when the freighter launched multiple assault crafts and set itself to self-destruct. With the help of Fireteams Majestic, Colossus, and Fenrir, the attack was repelled and the freighter was tugged back into space before it could self-destruct on Infinity. Following the skirmish, Infinity's after action teams discovered that the vessels used by the assailants belonged to a long-lost warship, the UNSC Spirit of Fire. The crew were having Roland put together a report on the ship. However, Hood told them not to waste their time as he knew all about the Spirit. Shortly after, Roland presented his findings on the freighter to Commander Bradley, Spartan Palmer, and Lord Hood. He found that although the crafts belonged to the Spirit of Fire, the Pilgrims Pride itself was fairly new in construction. When Commander Bradley inquired about the freighter's flight logs, Roland revealed that the ship's logs had been wiped and filled with false data. However, despite that, he was able to retrieve the real data, coordinates from where it originated: Oth Lodon, a gas giant located deep in Jiralhanae space. With the Spirit's possible location found, Hood ordered a search and rescue mission. Infinity jumped to the planet's system where it found a Covenant space station operated by New Colonial Alliance insurgents. It was then that Captain Daniel Clayton, illegitimate son of Captain James Cutter, revealed himself as the mole and fired on Infinity with the station's energy projector. Roland was unable to save the ship which was rapidly rendered helpless, with most of the bridge crew dead or incapacitated. However, Commander Palmer and Fireteam Majestic managed to capture the NCA station before it could destroy Infinity. Infinity was under repair for a month after the incident. In May 2558, Infinity was involved in a classified operation to infiltrate Ven III and capture a Sangheili in possession of a new biological agent. Roland coordinated the operation with Captain Lasky, monitoring communications from the Spartans Thorne and Ray as well as a UNSC spy drone on the planet. Once communications from both Spartans were cut off, Roland alerted Lasky and suggested that Infinity head toward Ven III to provide backup for the Spartans. However, the captain refused, as he had been ordered by Admiral Osman to be as discreet as possible, and instead had Roland call in Commander Palmer. Shortly later, once Spartan Thorne had been incapacitated and communications with Ray terminated abruptly, Captain Lasky ordered Roland to head to Ven III and call all teams on deck. Following the Battle of Oban, the Infinity made a slipspace jump to Galileo II. However the ship suddenly reappeared in an asteroid belt, colliding with an asteroid and causing some damage inside the ship. Roland informed Lasky of what occurred and ran a damage assessment. The Infinity jumped to slipspace again, only to reappear a quarter of a kilometer of her last position. Roland told Captain Lasky that it was not advisable to make another jump. Lasky ordered Palmer and Dr. Glassman to go to Infinity's engine room. Dr. Glassman discovered the Infinity's slipspace drive was overriding any coordinate except the one of the location in which they were in, sticking the ship in a "Slipspace Cul-de-sac". In that moment, Roland found an unusual energy reading coming from the equator of an uncharted planet near their position. Glassman and Lasky supposed that the location was the source of the problem and Palmer ordered to gather a team and send them with Dr. Glassman to the planet. Roland and Lasky observe the Janus Key loaded onto a Pelican. The reconnaissance team deployed to the planet, provisionally designated Aktis IV, to investigate a potential source of interference emanating from the surface. On an island in the middle of an ocean of a strange foamy substance, the Spartans discovered a Forerunner structure and Dr. Glassman was brought in to investigate. Glassman found an artifact that appeared to be compatible with the Janus Key and requested the UNSC's half of the Key to be brought to the surface for deeper analysis. In reality, the artifact was a decoy created by Halsey and 'Mdama to deceive the UNSC into taking their half of the Janus Key to the surface. While the Key was being prepared for transport, Roland questioned the decision to move the artifact to the surface as it may distract Glassman from his task of ascertaining the origin of the interference keeping Infinity stranded. However, Lasky was confident Palmer would be able to keep Glassman focused and believed taking the Key to the surface would not cost them anything either way. While updating Lasky on the status of the ground teams, Roland informed him that he could only contact Spartan Tedra Grant's team, as Palmer had gone off on a mission of her own and had taken Spartans Gabriel Thorne and Naiya Ray with her. Eventually, 'Mdama's forces were successful in acquiring both halves of the Janus Key and the Covenant fleet fled the system. Three days later, two Office of Naval Intelligence agents traveled to Infinity to speak with Palmer about the events that transpired on Aktis IV. Roland managed to briefly stall the agents, while Lasky spoke to Palmer personally about what had happened. Roland asking attention from Cpt. Lasky, Cmdr. Palmer and Dr. Halsey. "You created Cortana, Doc, and now you're throwing her out the airlock with these accusations! You think she tricked the Master Chief into abandoning his post? Respectfully, sir, to what end? Why is Cortana the problem?! Because she refused to die when she was supposed to?" — Roland accuses Doctor Halsey regarding Cortana. In October 2558, Roland cleared Fireteam Osiris's Pelican for landing aboard the Infinity, having just re-captured Dr. Halsey from Kamchatka. Halsey went to Captain Lasky with major news: Cortana was alive and active within the Domain, a vast information storage medium once used by the Forerunners. Roland was astonished to hear she was alive, but grew indignant as Halsey recommended extreme measures be taken against her immediately, arguing that Halsey was neglecting her own creation when Cortana was lucky to have survived. On Meridian, Osiris came into contact with the next phase of Cortana's actions: activating enormous Guardian constructs buried across the colonies. After the Guardian on Meridian was awakened, Roland recorded the sound of the Guardian's pulse sequence and heard that it contained information: the coordinates to a distant Forerunner site. At his suggestion, the Infinity began mobilizing to reach a dormant Guardian on Sanghelios where they could input the same coordinates in hopes that Osiris would be able to follow through its portal. Cortana attempts to take control over the Infinity. Lasky: "Continue random jumps. Steer clear of major settlements." Roland: "We're just gonna run?" Lasky: "Only until we can find a way to fight." — Lasky and Roland as the Infinity flees the conquest of Earth. The following day after initiating their plan, Cortana called for a mass rebellion of AIs, with many of them rallying to her side and forming a faction they called the Created. However, Roland was not among the defectors and remained loyal to humanity. Warning Lasky that the Created were shutting down all technology across human space, he and the Infinity narrowly escaped through slipspace when Cortana attacked them with a Guardian. As the Infinity made emergency jump after emergency jump to throw Cortana off their trail, Roland questioned Lasky as why they were just running, Lasky responding that they'd return one day to fight. After Edward Buck and Veronica Dare decided to get married, Roland suddenly interrupted their attempt to do so using an automated program on a tablet to do it himself. When questioned about the legality of having the AI marry them, Roland reassured Buck that it would be as legal as having the captain of the ship perform the ceremony. Roland went as far as to add that in many ways, he is essentially the ship itself and thus they couldn't get more authoritative than that aboard the Infinity. Having a great deal of respect for Roland due to his rejection of Cortana and the Created, Buck accepted his offer. Witnessed by both Fireteam Osiris and Alpha-Nine, Roland married Buck and Dare in a rather informal ceremony in a bar on the ship. Roland has a dry sense of humor and a slightly sarcastic personality. He occasionally flouts his superior intellect and doesn't like being contradicted or questioned. During the Requiem Campaign, he exchanged barbs with Jared Miller, going so far as to mockingly imitate Miller's reaction to a squad of Prometheans showing up at one point. However, his flippancy is balanced by a strong sense of morality. 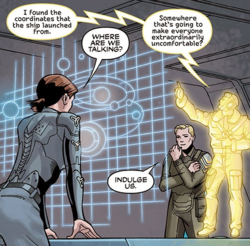 Roland twice lectured Doctor Halsey over her actions, first over why she was keeping secrets from the Infinity's crew, then second about her lack of concern for Cortana. Roland's compassion and sense of fairness may be why he did not turn to the Created during Cortana's uprising, despite hoping equal rights for AIs as beings. Roland's ability to see through Cortana's offer when so many other AIs didn't earned him the respect and affection of Edward Buck. According to Roland, in many ways he is the ship and thus a person can't find anyone with more authority aboard the Infinity than him. This grants Roland the ability to legally perform wedding ceremonies the same as the captain of a ship. When Roland married Buck and Veronica Dare, he did so in a rather formal and robotic manner and then congratulated them before going "feed the birds!" Roland is voiced by Brian T. Delaney. Despite the 20th-century precedent of his avatar, Roland's name bears a tangential connection to the mythology behind the naming of Cortana. Roland is a figure in medieval legend with a sword named Durendal; Cortana is named after Curtana, the sword of Ogier the Dane, which bore the inscription "My name is Cortana, of the same steel and temper as Joyeuse and Durendal." Durendal, in turn, served as the namesake of a principal AI character in Bungie's Marathon series. Roland has the authority to perform weddings. Concept art of Roland's face. Concept art of Roland's avatar. Full-body portrait of Roland's avatar. A close-up of Roland's avatar. Extracted view of Roland's avatar. Roland introducing the UNSC TACSIM to a group of SPARTAN-IVs. Roland with a virtual Pod infector in his hand. Roland displaying a hologram of Aktis IV. Roland and Cpt. Lasky on the bridge. Roland having discussion with Cmdr. Palmer and Dr. Halsey.